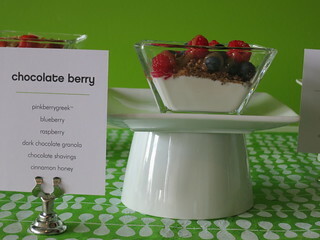 Gourmet Pigs: Now at Pinkberry: Greek Yogurt and Great Savory Bowls! Now at Pinkberry: Greek Yogurt and Great Savory Bowls! Did you know that Pinkberry now has greek yogurt? Not a "greek" frozen yogurt, but a bonafide greek yogurt, and they use it to make some great bowls! Yes, Pinkberry's not just about froyo anymore. 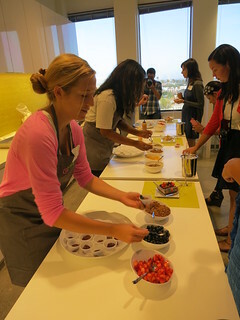 I was recently invited to the Pinkberry headquarters in Santa Monica to do a blind tasting of greek yogurts and try their new Powerbowls. When else will I get a chance to visit their headquarters?? When I eat yogurt at home, I usually just add fruit and granola to it - maybe honey. That's it, and you probably do, too. But Pinkberry has been getting quite creative with their greek yogurt! 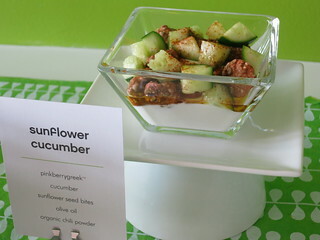 I was amazed by their Sunflower Cucumber combination in which they top their greek yogurt (named "Pinkberrygreek") with cucumber, sunflower seed bites (like sunflower cookies), olive oil, and chili powder. You don't have to have dessert at Pinkberry, you can have something savory too! I never thought of making something like this with yogurt, and was very pleasantly surprised. It was sweet and savory, silky and crunchy. This bowl has a very Mediterranean flavor to it, and will make a great light meal or snack. I'm already itching to go to a Pinkberry to get this. The strawberry and granola one was more what I'd expect to eat at home, but I also really liked their Chocolate Berry bowl, especially with the addition of the dark chocolate granola and cinnamon honey. The cinnamon made it just that much better. 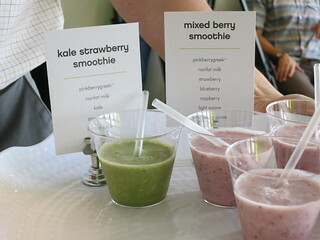 They also use Pinkberrygreek to make smoothies. The kale strawberry smoothie is an easy and tasty way to get your greens in. 1. This yogury was thick and creamy, but a little sour. This was revealed to be Chobani. 2. Thick but fluffier than (1). Smoother, sticks to the spoon more. Not as sour, but chalkier. This was Fage. 3. Thick, silky, smooth. Glossy finish. Not as sour and chalky. 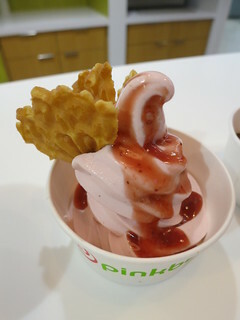 This one was revealed to be Pinkberrygreek, which is made with milk from Fair Oaks Farm. I did like the fluffy texture of Fage but the less chalky Pinkberrygreek is much more enjoyable to eat. 4. 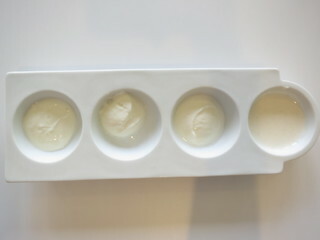 Vanilla flavored Pinkberry's Greek Yogurt. Slightly less thick but still silky. Sweeter, but can still taste the yogurt. The yogury is mixed in store with Madagascar vanilla to retain freshness. We then moved on to their Powerbowls. Think acai, quinoa, and the like. They even built it as we go during the tasting so the toppings don't get soggy. For now, the Brentwood store is their test store and will roll out new products like this first before anywhere else, but look out for these powerbowls in the near future. 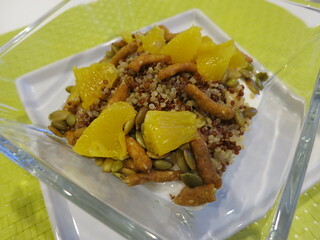 Once again, I was most impressed by their savory Powerbowl: the quinoa greek powerbowl, which has Pinkberrygreek, quinoa, orange, sesame sticks, pepitas, and a light touch of agave. Again it's that sweet and salty combination, the crunch of the sesame sticks. 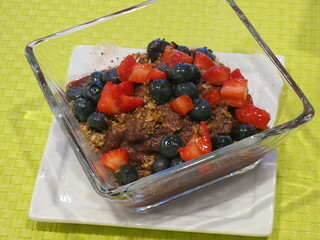 The Midnight Acai powerbowl comes topped with apple juice, berries, banana, and dark chocolate granola. 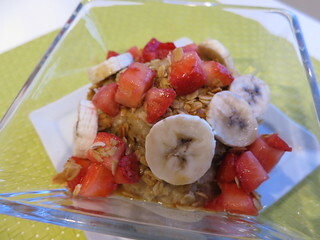 I was also very pleasantly surprised by the PB&J Oatmeal Powerbowl. The oatmeal is topped with banana, strawberry, honey almond granola, and peanut butter honey. Oatmeal with peanut butter, genius. The peanut butter has to be diluted by the honey, though - I went home and tried just adding peanut butter to my oatmeal but it was too thick. After the greek yogurt and powerbowl tasting, we had a taste of the upcoming Cherry frozen yogurt flavor which will be out in September, and met their oldest employee who is now in charge of getting the taste consistent. Rather than the cherry flavor, I was partial to the butter pecan Pinkberry. 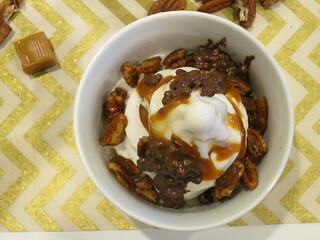 Especially topped with caramel, caramelized pecan and chocolate!